For a long time, it was easy to search for patents on the Web, but trademarks? Not so much. Thanks to startups like TechCrunch 50 grad Trademarkia, anyone can now do a simple keyword search and pick through each and every U.S. trademark filed since 1870 — if your heart so desires, of course. If trademark search seems a bit obscure, that’s because it is. But for big companies and startups alike, trademark registration is important for protecting their brand. What’s more, the ability to search by company, theme, product category, or even filing attorney for any and all things trademark can be a big timesaver. It’s also a great resource for research, for those getting ready to file a trademark, or for product and brand logo designers looking to see what’s out there (or who may be infringing). Then, with Trademarkia, users can even register trademarks directly with the U.S. Patent and Trademark Office for about $160. As a result, Trademarkia has been seeing some traction over the last year, as it’s nearing $50 million in sales, 3 million pageviews (and 1.5 million uniques) per month — its users filed over 10,000 trademarks last year. Last month, Josh wrote about the startup’s new sound trademarking service, which collects the USPTO’s bevy of sound marks (including digitizing the many old analog sound trademarks) to let users listen to existing trademarks — and apply for their own. This new feature lets users search the USPTO’s database of trademark oppositions by year, category, the biggest bullies, victims, and “hecklers,” the latter of which includes those companies that file extended oppositions to trademark applications to slow down the review/approval process. 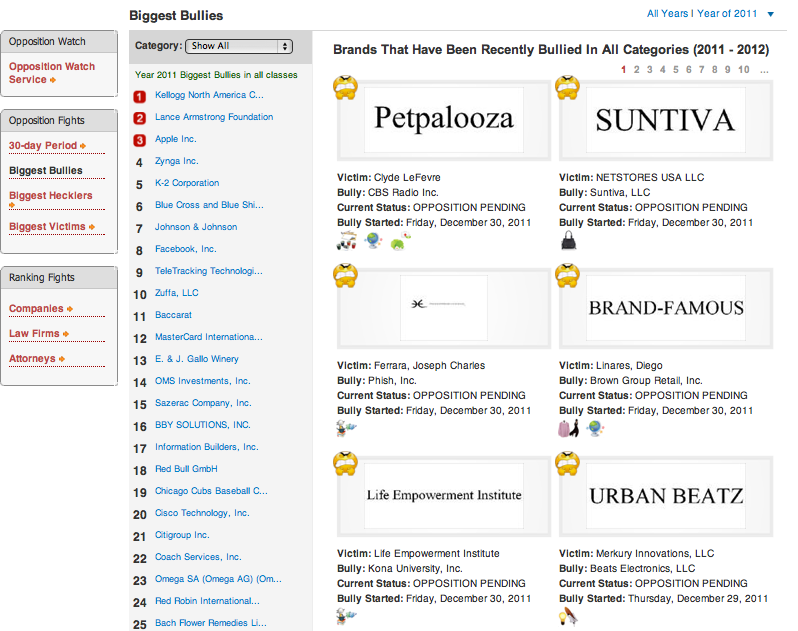 Interestingly, according to the USPTO’s data, Kellogg North America is the top “Trademark Bully” for 2011, with The Lance Armstrong Foundation, Apple, Zynga, and ski and snowboard maker, K-2, rounding out the top five. Mark Zuckerberg’s legal team ranks in at number eight. Granted, trademark bullying has been around for years, but it’s been difficult to see which companies are the biggest offenders — and the biggest losers. In 2010, the USPTO embarked on an effort to curb trademark bullying, and asked practicing trademark attorneys, trademark-owners, and others “about their experiences with litigation tactics”, according to IPB. This resulted in the organization attempting to better track trademark opposition, which Trademarkia has made universally available (and searchable) today. Obviously, for companies, policing one’s trademarks is essential to ensuring that no one (or no entity) is infringing on their valuable intellectual property. However, it’s been difficult to find out which companies are just standing up for their rights and which companies are actively bullying. Trademarkia’s searchable database goes some of the way towards improving this, letting users view plaintiffs and defendants within each category, and to quickly browse prosecution history and trademark details. Certainly, these examples draw attention to the question of whether or not a company can own a word, and of course Apple and Facebook are hardly the only ones. The Lance Armstrong Foundation has repeatedly attempted to block use of the word “strong” by other companies, for instance. Obviously, without a lot of attention from the press or other avenues, it’s difficult for small businesses opposed by the Goliaths to do anything but give in — or hire a better legal team. Trademarkia CEO Raj Abhyanker says that he thinks that the legal outcomes of these many trademark cases can have an impact on stock prices, future product launches, and even domain ownership. To give users a better sense of the results of trademark litigation, Trademarkia’s listings include angry faces for an active bullying attempt, a sad face meaning the “little guy” lost, while a smiley face means the victim prevailed. Obviously, users should be careful here — as it’s not always that simple. Lastly, for companies looking to protect their existing trademarks, the startup’s service also offers a free 30-day tracker, which lists all new trademark applications filed within the last 30 days. Users can also sign up to receive automatic alerts (through an email notification) for trademark applications submitted that have similar keywords. It’s a wild and wooly world out there in trademark land, and hopefully Trademarkia’s new features will help bring some clarity and accountability to the process. Bullies: You’re on notice.